Clean lines with a smooth finish, the 4' and 6' rectangular pedestal table is universal access and meets ADA compliance. Manufactured with commercial grade, precision punched perforated 12-gauge steel that provides an inviting, safe surface—the 5/8" hole perforated pattern also prevents the pooling of rainwater and other occasional liquefied materials. The MIG welded, steel tube frame features a bold, 4"Sq. single pedestal with 3"Sq. 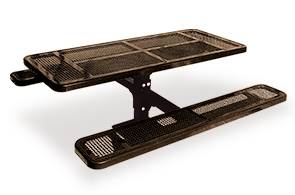 support arms, creating elevated bench seating that is secure, easy, convenient. The open, single pedestal design allows more leg room and a non-trip, walk through design for simple maneuvering in, out and around the table. Finished with an impact and weather resistant powder-coating, this frame is able to maintain its original beauty and form able to be surface or in-ground mounted.